A root canal treatment refers to the cleaning of the canals and the removal of infected and inflamed tissue within the root. 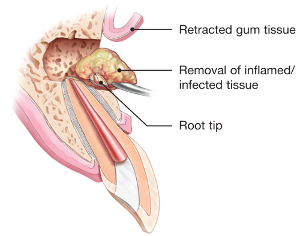 When the inflammation or infection persists after the root canal treatment, an apicoectomy, aka root end surgery, may be required. An apicoectomy is essentially the removal of the apex (or root tip), followed by a filling procedure to seal the root from further infection. When left untreated, infected roots can damage other teeth, spread infection, and cause destruction of the jawbone. Infected and inflamed soft tissue around the root of a tooth can be exceptionally painful and debilitating. The purpose of an apicoectomy is to eliminate the infection in the tissue and to ultimately preserve the function of the tooth and save it from extraction. An apicoectomy will rarely be considered by Dr. Cancellier unless the root canal systems are retreated first. Failures are often the result of missed root canals during the original root canal treatment procedure. By locating and treating the missed canal, and cleaning the other canals to the end of the root, the irritation or infection will usually resolve. Small Adjoining Root Branches – Roots are extremely complex and can contain many tiny branches. If these tiny branches cannot be cleaned and sealed when the root canal treatment or endodontic retreatment is performed, inflammation can persist. Prior to the surgery, Dr. Cancellier may prescribe an antibiotic or anti-inflammatory medication to treat the underlying infection. A limited field of view Cone Beam CT be taken to enable the surgeon to plan the apicoectomy, which will be performed under local anesthesia. Anti-anxiety medications are available upon re quest. 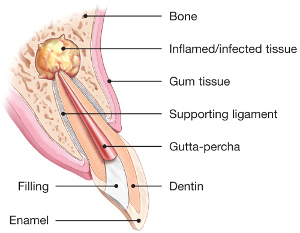 The surgeon will make a small incision in the gum and expose the root by lifting away the gum. In some cases, a tiny fraction of the jawbone may be removed to properly expose the root. 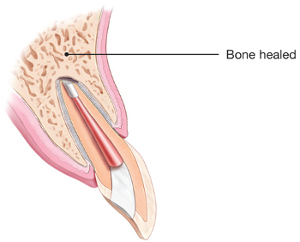 The edge of the root tip and any infected connective tissue will be removed using ultrasonic instruments. 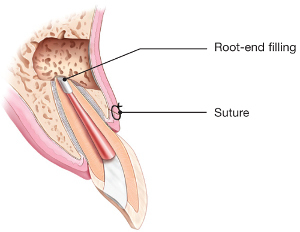 The root will be sealed using a retrofilling aka root-end filling (a biocompatible plug), and the surgeon will suture the gum with a few stitches.This surgery does not require an overnight stay, and full aftercare instructions and pain medications will be provided as needed. After three days, Dr. Cancellier will remove the stitches, and the connective tissues will fully heal several months after the procedure. If you are experiencing any symptoms, such as pain or swelling associated with a tooth that has had a root canal, we encourage you to contact our office immediately. We will be able to determine whether it is possible to save your tooth.